How community organizing and activism in support of public schools in one of America’s most economically disadvantaged regions has engendered impressive academic results. Can public schools still educate America's children, particularly in poor and working class communities? Many advocates of school reform have called for dismantling public education in favor of market-based models of reform such as privatization and vouchers. 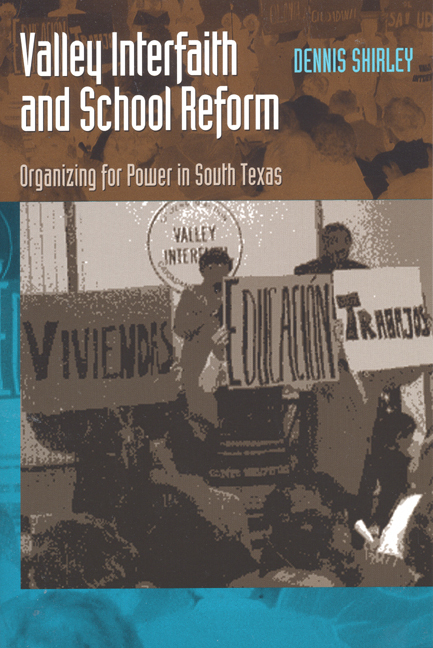 By contrast, this pathfinding book explores how community organizing and activism in support of public schools in one of America's most economically disadvantaged regions, the Rio Grande Valley of South Texas, has engendered impressive academic results. Dennis Shirley focuses the book around case studies of three schools that have benefited from the reform efforts of a community group called Valley Interfaith, which works to develop community leadership and boost academic achievement. He follows the remarkable efforts of teachers, parents, school administrators, clergy, and community activists to take charge of their schools and their communities and describes the effects of these efforts on students' school performance and testing results. Uniting gritty realism based on extensive field observations with inspiring vignettes of educators and parents creating genuine improvement in their schools and communities, this book demonstrates that public schools can be vital "laboratories of democracy," in which students and their parents learn the arts of civic engagement and the skills necessary for participating in our rapidly changing world. It persuasively argues that the American tradition of neighborhood schools can still serve as a bedrock of community engagement and academic achievement. Dennis Shirley is Associate Dean and Professor of Teacher Education at the Lynch School of Education at Boston College. The frontier between the United States and Mexico&151;which until the Second World War was the site of relatively modest population migration&151;has in the postwar era turned into one of the most dynamic and heavily traversed national boundaries in the world. The explosive growth of Mexican-origin populations in the major U.S. metropolitan regions has wrought dramatic changes upon North America's demographic, cultural, political, and economic landscapes. Concurrent with these broad changes, the educational system in the United States has sought to respond to Mexican immigration with a broad range of initiatives, of which bilingual education is perhaps the most salient, but in actuality represents merely one component of a broader movement for greater multicultural awareness and linguistic sensitivity in our nation's schools. The changes wrought by Mexican immigration have had an impact on the economy, politics, and culture of the United States in countless ways. Yet while much ink has been spilled concerning the challenges confronting the United States, U.S. citizens of Mexican origin, and Mexican immigrants in the current context, we are only just beginning to articulate a broader vision of educational theory and practice that can integrate these demographic transformations into a democratic synthesis that will enhance a rich civic life for immigrants and citizens alike. This topic is of increasing urgency because of both the growth of the Mexican and Mexican American populations in the United States and the imperative that future citizens have at least the foundations of an education that will enable them to participate in the nation's civic and economic life. Such analytic work is crucial if we are to sustain and extend our nation's democratic and republican legacy, both for Americans who have resided here for many generations and for the immigrants who seek opportunities in the U.S. economy and polity that they have been denied in their homelands. The current study is an effort to address this lacuna in scholarship by describing the efforts of a community-based organization in the South Texas borderlands to improve the living conditions of low-income citizens and immigrants and public schools their children attend. This work is significant because the worlds of community organizing and school reform have been distinct from one another until relatively recently. Community organizers addressed glaring injustices facing poor and working-class communities that pertained to health care, job opportunities, and crime, but refrained from tackling issues relevant to school reform. Educational reformers, on the other hand, focused on pedagogical, curricular, and assessment issues in schools without addressing the problems of unemployment, crime, and inadequate health care that have a disproportionate impact on low-income communities. The self-imposed boundaries thus established by community organizers and educators made sense to a degree, given the inability of any single group to address the staggering number of problems that confront poor and working-class communities. However, they impeded the exploration of common ground and the kind of intellectual exchange that can occur when individuals from different cultural and class backgrounds commit themselves to sustained learning from one another. Only recently have systematic efforts begun, predominantly in metropolitan areas of the Southwest, to cross boundaries and to examine both how community organizing can catalyze the work of school reform and how transformations in a school can give a politically disconnected community a locus for civic engagement. The initial results of these efforts have been intriguing and call for further study in other settings that reflect the diversity of the American civic and cultural landscape. A second indication of the significance of this work has to do with larger issues confronting public education in the United States in the current political and economic conjuncture. For a variety of reasons, Americans' faith in their public schools is at a historic low, and surveys indicate that a majority of Americans would now prefer to send their children to private schools if expense were not an issue. At the same time, recent economic trends have exerted a downward pressure on the wages of poor and working-class Americans and have caused the United States&151;once the proud bastion of a strong middle class&151;to become the world's most economically stratified developed country. When combined with other data tracking a decline of civic engagement and secondary associations over the last thirty years in the United States, the net effect is a troubling portrait of a society characterized by a decline in citizenship and the "brasilianification" of the economy. While these trends have been problematic for many adults, they have been catastrophic for children growing up in conditions of poverty. In this context it is imperative to learn about countervailing efforts to mend the fabric of everyday life and promote the civic engagement that is the sine qua non of free and pluralistic societies. A third aspect of this work has to do with the changing nature of classroom instruction in the United States. Partly as a result of the poor showing of American children in international comparisons but also driven by the political opportunities afforded by a troubled educational system, American reformers have developed a massive battery of high-stakes standardized tests over the last fifteen years. It has become increasingly apparent to observers that those tests now determine a significant portion of the de facto instructional, curricular, and assessment practices in public schools in the United States. Preliminary research indicates that test-driven reforms dominate the practices of schools serving low-income and minority children more than those serving white, middle-class children. Teachers in South Texas are under extraordinary pressures to demonstrate that their students have mastered academic subject areas such as reading, writing, and mathematics. At the same time, the teachers are aware that their children come from communities that lack the economic infrastructure that most Americans take for granted, and that problems with crime, substance abuse, and lack of access to health care afflict their communities at disproportionately high rates. How the schools and communities grapple with these challenges, and aspire to academic excellence at the same time that they recognize and seek to overcome debilitating conditions of poverty, defines the central terms of debate for educators and community organizers in the accounts that follow. By attending to the issues entailed in high-stakes standardized testing in public schools and integrating data on test scores into the narrative and analysis, this account does not in any manner seek to endorse uncritically the use of such tests as the Texas Assessment of Academic Skills (TAAS). Numerous studies have documented that standardized testing has often been used in a manner injurious to the educational interests of some students, particularly minorities, but also girls and women. Even if a test has high degrees of reliability and validity for individuals, it can still be used by others&151;whether they be teachers, testing experts, business leaders, or politicians&151;in ways detrimental to the test-takers. Walter Haney has argued that what is key in interpreting test results is not their predictive power but their "educational validity"&151;that is, the extent that they help individuals to continue to learn. "And from a more positive perspective," Haney wrote, "what is needed is to use test results not so much to make decisions about individual students, as to examine critically how our schools are serving their interests." It is in this sense that the present study incorporates test score results into both description and analysis. Thus, the following account seeks to describe innovative work fusing community organizing and school reform in a regional setting characterized by high rates of immigration of families from Mexico. To accomplish these purposes I shall first describe the origins of the community organization known as Valley Interfaith that has struggled for more than fifteen years to improve housing conditions, health care, employment opportunities, and schools in the Rio Grande Valley in Texas. I shall then present case studies of three schools that have collaborated with Valley Interfaith and struggled to increase parental engagement, address pressing community needs, and achieve high levels of academic success. Finally, I note points of comparison and contrast between the schools, and indicate those areas that appear most fruitful, as well as those that seem problematic, for future explorations in the intersection of school reform and community organizing. The theoretical framework guiding these investigations is informed by recent work in political science, economics, and sociology that indicates research into the social capital of a community can go far in explaining both its strengths and its problems. In contrast to financial capital, which designates the value of money, or human capital, which refers to an individual's intellectual and physical capabilities, social capital comprises the values embedded in social relationships. A grandmother or an aunt who provides child care in the afternoon for children while their parents work reflects one informal kind of social capital, while social capital can also be formalized through institutional arrangements such as a Girl Scouts chapter, a PTA, or a congregation. In addition, social scientists also distinguish between bonding social capital&151;which occurs among individuals in an institutional setting such as a church or trade union&151;and bridging social capital, which refers to strong lateral ties between individuals across organizational boundaries. In terms of schools, I will refer to bonding social capital as that which strengthens social ties among teachers or between teachers and students, whereas bridging social capital will designate ties that can be created between teachers, clergy, and community activists. Social capital theory has recently been brought to bear on a wide range of topics confronting American society, from low voting patterns to school failure to crime. At first advanced tentatively by economist Glenn Loury, the idea was then developed with more rigor by sociologist James Coleman, who applied it to explain what he perceived as the superior achievement of Catholic schools in educating low-income urban youths. It was not until political scientist Robert Putnam published his now famous essay "Bowling Alone," however, that social capital theory gained widespread popularity as an explanation for fin-de-siècle malaise in the American body politic. "Bowling Alone" identified a pervasive disengagement of Americans from civic institutions and social life. According to Putnam, Americans over the last quarter century withdrew from trade unions, PTAs, and face-to-face voluntary associations on a historically unprecedented scale. Putnam suggested that this disengagement manifested itself through a drop both in voting and in participation in mediating institutions such as churches and civic clubs, as well as through a decline in social trust. In its most dramatic expression, social decapitalization appeared to reflect the problems of a society that had lost its moral bearings and cultivated individualism and materialism at the expense of sociability and an ethic of mutual responsibility. Putnam's "Bowling Alone" was easily the most influential monograph of its type to appear in the 1990s, and it spawned a veritable industry of scholarly research on social capital even before an expanded version of the argument appeared in book form in the summer of 2000. It is intriguing to note that even when critics attacked Putnam's findings they generally did not question the utility of social capital theory as a framework for evaluating social problems. Andrew Greeley, for example, took Putnam to task for failing to acknowledge the concentration of social capital in religious institutions in the United States, but explicitly sought to refine social capital theory in the process. Similarly, Alejandro Portes criticized Putnam's use of the concept for its "logical circularity," believing that Putnam construed the concept in such a way that it was both a cause and an effect of virtually every social problem in contemporary American society. Like Greeley, Portes sought to circumscribe the boundaries of social capital more clearly to ensure that the notion would maintain its conceptual rigor. The work at hand seeks to maintain this spirit of creative reconceptualization and development of social capital theory, in this case in the nexus of education and community engagement. Recognizing that social capital theory is in the infancy of its development&151;just as human capital theory was a generation ago&151;we must anticipate that only continued theoretical and empirical work will clarify whether social capital will develop into a truly robust concept that can clarify hitherto obscure facets of social life. In the current study, I endeavor to use social capital theory to explore contemporary efforts in the overlapping terrain of school reform and community organizing in three South Texas schools and communities. I also seek to criticize and refine social capital theory by distinguishing between different kinds of school and community ties and underlining their varying ramifications. For example, there is a world of difference between a parental involvement strategy in a school that uses parents for cafeteria duty or photocopying and a parental engagement approach that develops parents' leadership capacities to attack social injustices in a school or community. Likewise, the potential for social capitalization is far greater in a school in which a principal works actively with local religious institutions and community organizations to enhance culturally congruent pedagogy and curricula than in a school where a disconnected administration adopts a laissez-faire attitude toward parents and their community. Precisely because "parental involvement" or "community outreach" are such widely accepted slogans in contemporary American education, theoretical rigor in disaggregating robust social ties from their more superficial counterparts is of some urgency if we are to develop public schools as centers of civic engagement rather than islands of bureaucracy that are devoted more to district and state mandates than to the communities they serve. Throughout the narratives that follow, we shall explore whether the concept of social capital can bear the amount of theoretical weight attached to it in recent contributions in the social sciences. If parents become more engaged in their children's school and in community development, does that engagement necessarily translate into increased academic achievement for children? James Coleman suggested that social capital explained the superior outcomes from Catholic school education over public schools in inner-city communities, but subsequent commentators have noted that Coleman's analysis was fundamentally flawed, for two reasons. First, Coleman's study focused on academic achievement at the high school level, but the youths in his study typically did not come from a parish in close proximity to a school, but rather from a scattered metropolitan area. Second, the parents were more or less involved in a fiducial relationship with the school; they trusted and supported the school's authority, but were not otherwise particularly engaged with it. In spite of this incisive criticism of the fundamental premises of Coleman's work, the notion that social capitalization could cause high levels of academic achievement has continued to provoke interest among sociologists of education. One gets the impression from much of the social capital literature that social capitalization is a cure-all not only for student learning, but for almost every other problem that afflicts American society. In the case studies that follow, a more complex portrait will emerge&151;one in which social capitalization has many benefits but in which a pattern of causation in terms of raising academic achievement is ambiguous. These findings will then lead into a more nuanced inquiry, in which social capitalization has an intrinsic worth in terms of its contributions to human relationships and community development, but is not viewed as a panacea either for the multitude of problems that confront underresourced communities in general or for issues relating to student academic achievement in particular. In addition, we shall also explore what might be referred to as the "hidden costs of social capitalization." Extensive research indicates that school reform efforts typically assign classroom teachers hosts of new responsibilities without any corresponding relief from the already demanding tasks of planning instruction, teaching classes, and fulfilling administrative requirements. This phenomenon of "intensification" can cause teachers to lose a focus on student learning, expend valuable time on issues peripheral to their vocation, and in extreme cases leave their profession. If social capital theory is to make a lasting contribution to school reform, its adherents must recognize the problems inherent in intensification and develop strategies to assure that instruction by classroom teachers is not compromised, but enhanced. Although social capital theory is in need of further elaboration, even in its current incarnation it offers a crucial and often missing analytic tool for those who are concerned with the political and economic problems that characterize contemporary American civil society. Rather than the reigning methodological "individualism" that studies institutions and social phenomena in relative isolation from one another, social capital theory is interested in the nexus between institutions, cultures, and group norms. This last point is particularly important, because by recognizing that values infuse and shape social relationships, social capital theory challenges both functionalist and structuralist schools of social analysis and restores the centrality of norms to social inquiry. Finally, social capital theory, with its explicit interest in secondary associations and civil society, provides a heuristic device that can diagnose problematic areas in which social networks have weakened and, at least potentially, lead to strategies that will strengthen those networks that exist in the interstices beyond the reach of both the state and capitalism. It can thus generate new forms of knowledge in the key intermediate zone of "civil society" that entails families, religious institutions, and neighborhood associations and that exists between the bureaucracies of the welfare state and the vagaries of the marketplace. The region called the Rio Grande Valley in South Texas belongs to a swath of land known as the "Trans-Nueces" that was wrested from Mexico by the United States after the Mexican War under the terms of the Treaty of Guadalupe Hidalgo in 1848. In subsequent decades Anglo-Americans settled the region and gained an upper hand in both the economics and politics of the Valley&151;as it is called by locals and Texans in general&151;freely exercising extralegal forms of political intimidation and establishing a dual labor market that discriminated against indigenous Mexican and Mexican American campesinos and workers. Tragically, the leadership of the Catholic Church in the region played an important role in reinforcing rather than challenging the anti-Mexican racism of the Anglo-American elite. The native Mexican population did not respond passively to the incursions of the Anglo-American settlers; rather, it mixed forms of accommodation to North American culture with both spontaneous and organized forms of political resistance. These included outright rebellion, with a call to restore land to Mexicans deprived of their land after the annexation (the Cortina War); individual acts of self-assertion against the rule of South Texas lawmen (Gregorio Cortez); and a series of raids against Texas Ranger patrols and United States Army detachments as part of a determined campaign to drive Anglo-Americans out of the American West (los sediciosos). In the late 1800s and early 1900s, with the growth of railroad lines west of the port city of Brownsville, Anglo-American economic penetration of the Valley increased; and the region was settled by a new wave of land speculators, sugarcane planters, citrus farmers, and merchants, all of whom sought to capitalize on plentiful land, cheap labor, and a rapidly expanding consumer market. In this same time period a host of new communities were established whose names bear the marks of their Scottish immigrant and Anglo-American founders, such as McAllen, Edinburg, Harlingen, and Pharr. In spite of some positive indicators, however, economic growth lagged behind the rest of the country. Although the Valley increased its agricultural output dramatically throughout the following decades, by the early 1970s McAllen, the largest city in Hidalgo County, was the poorest metropolitan area in the entire United States. More recently, the Valley has undergone some of the strongest population growth in the United States. Propelled by the establishment of a free trade zone just north of the Rio Grande, maquiladoras on the Mexican side, and the anticipation by international investors that the region is likely to experience economic growth, the Valley's trajectory offers a point of contrast to other rural areas in the United States that have suffered economic decline and massive out-migration in the last quarter century. In addition, the commercial success of the Chicana singer Selena and the boleros, corridos, and norteños that she popularized have created greater curiosity and interest in the region's culture from Americans of all walks of life. While positive developments have occurred in the Valley, however, a host of indicators reflect a deeply troubled region. More than a third of the predominantly Hispanic population in the Valley is poor, and unemployment rates have fluctuated between more than double to almost quadruple Texas state averages in the last twenty-five years. Education is a key problem for Valley residents: more than half of the adult population over eighteen years old has not completed high school, and many citizens and immigrants lack the linguistic and technical skills to participate in an economy in which knowledge plays an increasingly decisive role in determining the value of wage labor. Environmental analysts concur that the Rio Grande, the primary waterway that sustains the Valley, is by far the most polluted river in North America. As if economic, environmental, and educational woes were not enough, Valley residents suffer a variety of health problems&151;such as gastroenteritis, tuberculosis, hepatitis, diabetes, and various skin diseases&151;at rates three to six times the national average. Finally, the passage of the North American Free Trade Agreement (NAFTA) in 1994 has proven to be a massive disappointment for the residents of the Valley, who have watched jobs continue to head south of the border, where wages are far lower. Most of the major economic decisions that impact the region continue to be made in distant places such as Dallas, Houston, and Mexico City. The problems encountered by Valley residents are therefore severe when measured against the standard of living that most citizens of the United States and other industrialized nations take for granted. Some of the problems&151;low rates of formal education, a population disproportionately impacted by a restructuring economy, and restricted access to health care&151;mirror problems experienced by Latinos on a national scale, while others reflect the increasing stratification of wealth and the growth of child poverty that are national and multiethnic in scope. While these problems clearly call out for multifaceted and bold experiments in social policy&151;perhaps modeled on strategies developed by other industrialized nations&151;it is also becoming increasingly clear that education, perhaps more than any other single factor, is absolutely essential to acquire the income needed to sustain a family with a middle-class standard of living in the United States for the foreseeable future. It is therefore imperative to document experiments in school reform and renewal that can enable traditionally disenfranchised populations to enjoy the fruits of an education that will enhance their economic opportunities and enable them to experience both the pleasures and challenges of engagement in American civil society. It is in this context that the work at hand is important. In what follows, I first describe the origins of Valley Interfaith, a grassroots community organization in the Rio Grande Valley. Describing both the political and social context of the Valley and the singular nature of Valley Interfaith's broad-based organizing effort is central if one seeks to comprehend the nature of its impact in the region. The narrative then turns to three case studies of schools in Hidalgo County that have sought to increase both academic achievement and political engagement on behalf of children and families through collaboration with parents, congregations, and Valley Interfaith. I begin with Palmer Elementary School, located in Pharr, and trace the origin of its collaboration with Valley Interfaith back to issues pertaining to the impoverished communities it served in the 1980s; I will then examine how teachers, administrators, and parents at Palmer used those issues to develop social capital for purposes of school reform. The narrative then turns to Alamo Middle School, which was transformed in its first ten years from a crisis-ridden school characterized by repeated outbursts of youth violence and administrative paralysis to a learning community with a team structure that allows for personalization of instruction and deepened community ties. Finally, I end with Sam Houston Elementary School in McAllen, and investigate the manner in which this school's struggles for high academic achievement have been nurtured through its collaborative relationship with the parish of Saint Joseph's the Worker Catholic Church. The methodology employed in conducting this research is qualitative and consists of a mixture of snowball sampling, focus group interviews, ethnographic classroom observation, and the selective incorporation of quantitative data such as test score results, student attendance records, and the number of students in bilingual education classes. Test score results for the schools, along with comparable data for their districts and economically disadvantaged students in Texas, are presented in tabular form in the appendix. To enhance social trust and to test the veracity of my research I regularly sent drafts of my writing to community organizers, principals, teachers, and clergy and nuns involved in school reform. I found that the calculated risk of sharing research&151;while being perfectly clear that the research must contain a critical component&151;not only increased the richness of my documentation but also deepened my relationships with my informants, who were eager to gain another perspective on their work. Given the reality that social science research in the United States is inextricably enmeshed in issues of ethnicity, language, gender, and class, a deliberately dialogic methodology seemed a fruitful strategy for building relationships between the researcher and community members and mutually enhancing the reflectivity of all involved. While conducting previous research on the collaboration of urban schools with community-based organizations in Texas for the book Community Organizing for Urban School Reform, I documented the work of metropolitan organizations affiliated with the Texas Industrial Areas Foundation in a network of schools called "Alliance Schools." However, I chose not to address community-organizing work that had occurred in the Rio Grande Valley. Cautioned by the writings of border scholars Américo Paredes and José Limon, I believed that folding the Valley into a collection of case studies on urban schools would more likely obscure than illuminate the cultural and political dynamics of the region. Rather, I intended to develop a separate study of community organizing and school reform in the Valley that would recognize the cultural complexity and uniqueness of the Lower Border while simultaneously attending to the specific etiology of school reform work in that context. The present work is the result of those considerations. The research was conducted through a series of site visits to Palmer Elementary, Sam Houston Elementary, and Alamo Middle School from the spring of 1997 to the fall of 1999. In addition, I also interviewed activists in other community organizations working with farmworkers and undocumented immigrants; made home visits with parent liaisons and principals; attended Valley Interfaith activities such as press conferences, "accountability sessions," and the fifteenth-anniversary celebration in Edinburg in March 1998; interviewed political leaders such as McAllen mayor Othal Brand, Texas governor Ann Richards, and Lieutenant Governor Bill Hobby; attended Mass at Saint Joseph's the Worker Catholic Church in McAllen; enjoyed forays across the border to restaurants in Reynosa and Las Flores for cabrito with my always gracious and generous hosts; and (last but not least) survived Hurricane Bret in August 1999. As with my previous research, I decided that my investigation was likely to be most fruitful if I focused on schools where the community-organizing work was most developed rather than on those that were just beginning a partnership with Valley Interfaith. In conducting this research I have endeavored to triangulate my findings to check for the use of hyperbole or other forms of distortion in my informants' comments. As with any account of this nature, it is susceptible to confirmation bias, in which the researcher's sympathies with informants impede the development of an impartial and balanced perspective. To correct against this possibility, I sought out teachers, parents, students, politicians, and clergy who had made critical comments about Valley Interfaith and the schools under investigation, and have woven their perspectives into the ensuing narratives and analysis. The resulting portrait endeavors to combine a mixture of hope at small victories garnered in classrooms and communities as well as realism about the daunting challenges facing children, parents, educators, and congregations in the South Texas borderlands.